Moses certainly had a miraculous beginning, but God also greatly used him through the latter part of his life. This second part of “The Story of Moses (Lesson 4 of the series),” will teach children that no obstacle is too great for God! 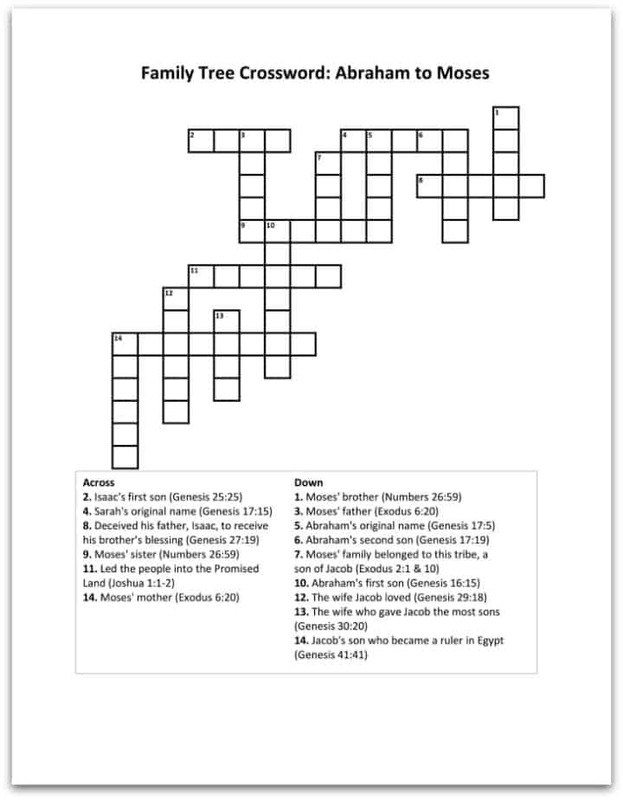 In addition, there is a crossword at the end of the lesson to help the children remember previous lessons while reminding them that God used many people to fulfill his promise of a Savior. OBJECTIVE: To teach the children that God enabled Moses to fill a unique role even though he faced challenges along the way. MAIN IDEA: Moses’ was a part of God’s promise to Abraham and Jacob that their ancestors would be blessed. God continued his protection and provision for the Hebrew people through Moses’ leadership to the Promised Land. ICEBREAKER REVIEW: Remind the children about last week’s lesson about Moses. Say, “We learned that Moses was God’s chosen leader to deliver the Hebrews out of Egyptian slavery. What miraculous events happened during the first part of Moses’ life?” Discuss Moses’ adoption by Pharaoh’s daughter, his flight to the desert and return to Egypt 40 years later, seeing the burning bush, and imposing plagues on Egypt because Pharaoh wouldn’t free God’s people. Explain that today’s lesson will cover the second part of Moses’ life by beginning with the parting of the Red Sea. Start by explaining that God led His people by a pillar of cloud during the day and a pillar of fire by night (Exodus 13:20-22) to show them where/how to travel. Ask for volunteers to read Exodus 14:5-7, 15-18, 21-22, & 26-28. Ask, “How many chariots did Pharaoh bring and why would that be scary (600, scary because it would have been impossible for the Hebrews to outrun them)? How did God ‘gain glory’ through the Egyptians who tried to cross the Red Sea (none of them survived)?” Encourage the students to never underestimate God’s ability to protect them! Next, explain that God set up a new way for his people to worship. First, Moses’ brother, Aaron (and his sons) received a special title – Exodus 30:30. God then gave instructions to build a tabernacle, or moveable place of worship. Learn about the tabernacle by reading the following passages: Exodus 25:10-11 (the ark), Exodus 26:1 (ornate curtains), 26:15-17 (acacia wood frames – strong and impenetrable by water/insects), Exodus 37:16-17 (articles of gold). Show a picture of the ark and the tabernacle. Ask, “How do these pictures represent God’s glory (their beauty, costly materials, ornate articles, etc)?” State that the tabernacle was a place where God literally met with the priests to accept animal sacrifices as the atonement for sin. Ask, “Why don’t we sacrifice animals anymore (because Jesus’ blood was the ultimate sacrifice for our sins)?” Present the message of salvation through Jesus Christ and allow time for any questions about salvation. Comment, “Moses and the people wandered in the desert for 40 years because time and time again they disobeyed God. Even Moses wasn’t allowed to enter the Promised Land because he acted in anger to one of God’s commands (Striking the rock instead of speaking to it for water in the Desert of Zin – Numbers 20:9-12, Deut. 32:48-52).” Talk about the reality of Moses’ disobedience resulting in a serious consequence and how we face similar consequences when we know to do right but choose to do what’s wrong instead. Ask, “Why did it matter to God whether or not Moses obeyed him completely (because he was a leader and showed a lack of trust)? How does anger hurt our relationship to God and others?” Read Ephesians 4:26-27. Comment that anger in itself is not a sin, but, as Moses displayed, acting out in anger in the wrong way is a sin! Print the crossword (download here) and give each child the handout. Then pass out the writing utensils and complete the crossword as a class to review previous lessons and today’s lesson. RECAP: God continued doing amazing things through Moses’ as he led God’s people to the Promised Land. We know that no challenge or obstacle is too great for God because he always keeps his promises!